The small quilt sandwich seen above is an accomplishment of conversational prints! It is a pun, do you get it? Total geeky cackle over here, this is great birding humor! 🙂 I got into textile design because I fell in love with conversational prints. So, I particularly like this combination of fabrics. But I am also an armchair birder. My bird magazines come and it really is all about the pictures! Years ago, I found the Audobon’s list of 20 Common Birds in Decline during an internet search. I sat reading the article, tears rolling down my face. But just as strongly as the tears themselves was the belief that I could do something to raise awareness for these birds. I felt resolved. I don’t know how this occurred, just that it did. I began scouring the net for information about the birds’ habitats and the needs of that habitat (and it’s inhabitants) to maintain symbiosis with these 20 birds. I decided to make artwork for each of the twenty birds on the list. 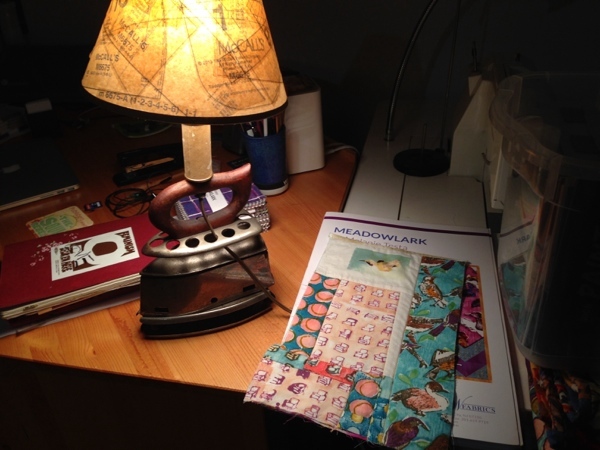 Meadowlark’s bird fabric contains six of the twenty birds on Audubon’s list. I have tried to contact their corporate office to inform them of my project, but they don’t answer the call.I wish they would because I don’t want to unintentionally misinform, but, oh well. I will do my best. Cancer treatment really made me a different person. It is a big deal to go through. But it has also served to motivate me. It gave me time to think about what I wanted and to daydream about how I might achieve it. It showed me how little time I have and that I want to make a difference. As I lay in bed during treatment, I watched David Attenborough’s Life of Birds. I watched it over and over, except for the burrowing parrots. (Those birds are mean little birds. I didn’t watch that segment hardly at all.) But I lay there watching and wondering how I could do to help the birds that I so adore. I drifted off to sleep, came back, watched more. It was dreamy. But in viewing the show and thinking about what is important to me, I kept coming back to the list of Common Birds in Decline that affected me so deeply. I have been exploring the imagery of The 20 birds in all media, paper, cloth printings combined with hand embroidery. So when it came time to start designing fabrics for release in my line, of course, I decided to feature some of the birds on the Audubon list. 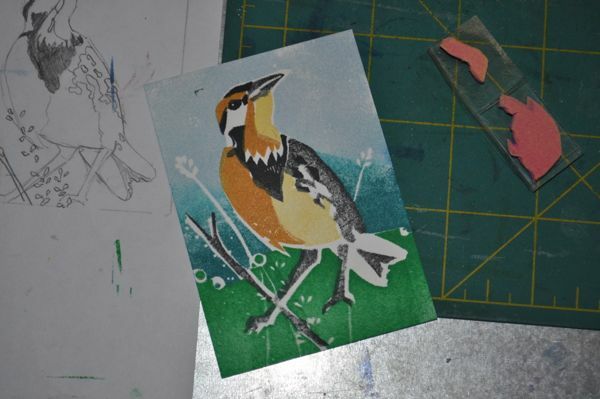 I hope to be able to create a fabric for each of the birds on the list, we will see. I will be blogging about these new works and the birds themselves in the next few months. I hope you enjoy my ramblings on the topic of birds. The Eastern Meadowlark is on the List, unfortunately. It’s numbers have decreased by 73% in forty years. 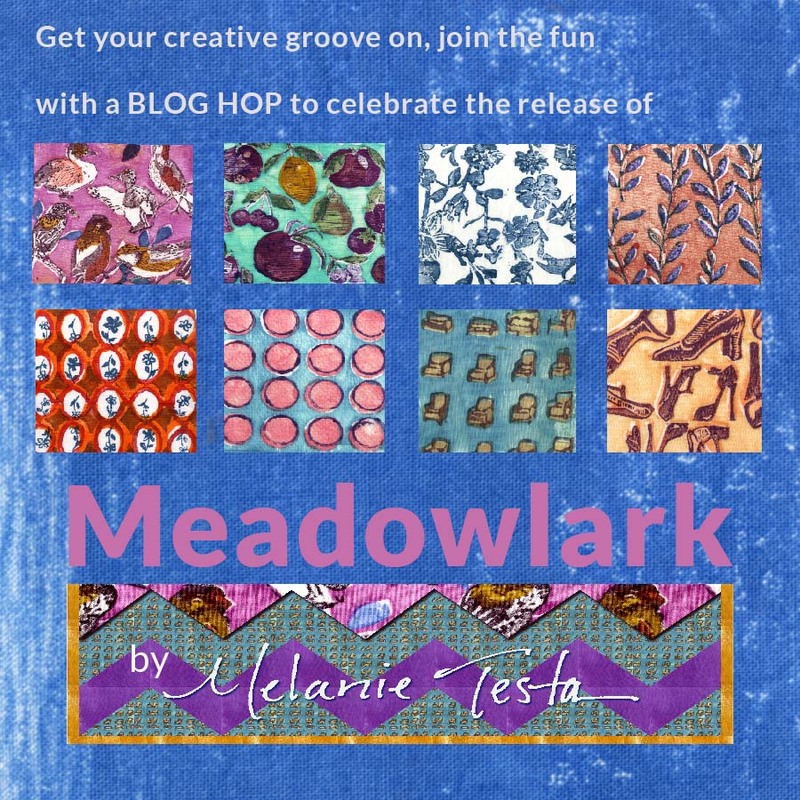 Here is a good place to start learning about Eastern Meadowlark and what you can do to help this bird. Oh, this post made me weep. For the lost birds, for the beauty you have created, for the inspiration. Thank you, Melly! I love that we are both bird geeks. I grew up with two parents who had binoculars at every windows, and it was quite common for us to pile into the car to go see the tree full of Cedar Waxwings, or whatever else was spotted in the area. I love your devotion to raising awareness of birds in decline. For my part, I have a large area of great bird “cover” in my garden and many, many feeders and water sources for my local visitors. I enjoyed working with your absolutely beautiful fabric, Melly. It was an honor. Pretty painting of the meadowlark, sad their numbers are going down. The fabrics look interesting. Melly, jsut call the local Audubon chapter…they can send the news to National. Cool bird designs! Thanks for sharing the development/inspiration for this fabric line. I’m sorry that you had to endure cancer, but I know that adversity can bring beauty, strength, and inspiration. It certainly did for you!